Yeah, but: It's a great introduction for people who look at letters. The Long Version: Ellen Lupton is quite an accomplished woman, and Thinking With Type isn't the only book of hers in the household. 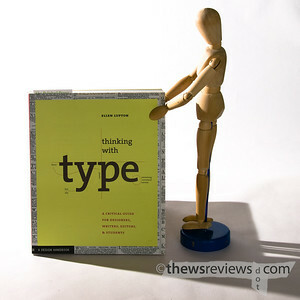 But it is the first book on typography that I've read, and I'm glad that it's the one that I found first. It's very clearly written, has excellent samples and examples, and is a very interesting book. It starts with the single line "Typography is what language looks like." on a page all its own, and it sets an excellent tone for the book. Thinking With Type covers a broad range of subjects with ease and style. If you don't know what kerning, ligatures, or x-height is, don't be put off. There's plenty of technical information and background on significant fonts, but without bogging down in detail. The mix of very readable main text, side diversions, and illustrations makes for an interesting and varied experience. Its also a very recent book, ©2004, and has current examples and deals with web page design as well as printed material. I've since moved on to more esoteric material, but Thinking With Type is the one I'd recommend to people who only have a casual or passing interest in type and graphic design. Its subtitle of "A critical guide for designers, writers, editors & students" is right on.